High Dynamic Range or HDR is the future of television. TV manufacturers, content creators, and distributors like Amazon and Netflix are all busy working on new HDR technology and content. High dynamic range photography has been around since the 1850s when Gustave Le Gray experimented with the idea of making several exposures to fix an extreme range of luminance. He rendered seascapes which showed both the dark sky and the bright sea. One negative alone could expose for either the sea or the sky, but not both. So Le Gray used one negative for the sky, and another negative with a shorter exposure for the sea. He then combined the two into one photograph. Later in the 20th Century, the practice of “burning and dodging” a film print was developed. 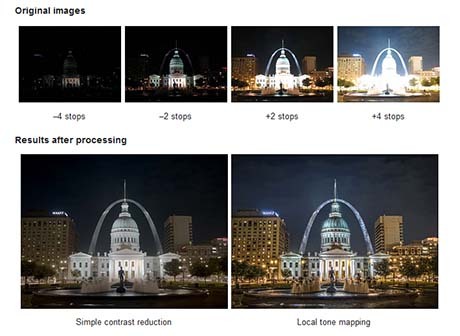 This method could also extend the dynamic range and produce stunning images. The terms “burning and dodging” are still used in Photoshop which has a burn tool and a dodge tool. These digital tools accomplish the same results that used to be done in the days of light-sensitive film and chemistry. With the advent of digital cameras, it became possible for the camera to do all the work. In a nutshell, one photograph has a set dynamic range. This is the ratio of light to dark in a photograph. So the photographer chooses which light values will be visible with a particular exposure which best emphasizes the subjects. Dynamic range is measured in F-stops. For instance, a pocket camera is rated at 6 F-stops of dynamic range. This is about what the human eye can discern (6.5 F-stops), but unlike a camera the human eye is always looking around and adjusting. This gives us the ability to see about 20 F-stops. The best cinema cameras can read 14 to 16 F-stops of dynamic range. Cameras with HDR take several shots with different exposures when the shutter is pressed. 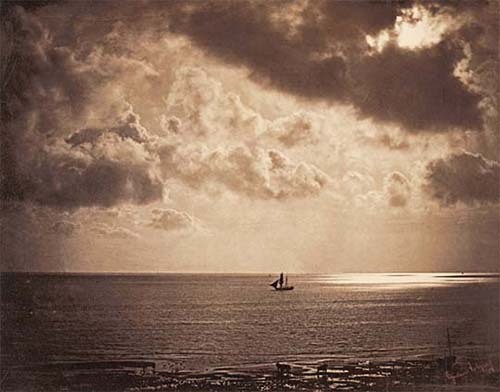 Combining these shots is like combining the negatives as Gustave Le Gray did over 150 years ago. Today there are many cameras and smart phones that offer HDR photography. Starting with the iPhone 4, HDR photography has become common. There are several Android phones that offer HDR and there’s even an app for that called Pro HDR which is available in Google’s Play Store for $1.99. There’s a lot of time lapse HDR these days, but this is still photos, not real video. (The difference may be a moot point.) One enterprising fellow made an HDR video using two Canon 5D mark II DSLRs, each capturing the exact same subject via a beam splitter. The cameras were set so one records the subject overexposed, the other underexposed. After the footage has been recorded, a variety of HDR processing tools are used to combine the video from the two cameras, yielding the clips you see in the link above. If you’re taking 4 shots (with different exposures) for each frame, you can see that video HDR increases the work load of the processor as well as the file sizes. A few high-end camera manufacturing companies such as RED® and Arri® have developed digital sensors capable of a higher dynamic range. For example, the RED EPIC-X can capture HDRx images with a user selectable 1-3 stops of additional highlight latitude in the “x” channel. This “x” channel can be merged with the normal channel in post production software. This adds dynamic range to the final video. Current RED® cameras capture over 13 stops of dynamic range in standard mode, which not only surpasses high-end DSLR cameras, but is also comparable to color film negatives. Although this is more than enough for most applications, sometimes even more is desired. Panasonic offered the first consumer camcorders camcorders that shoot both 4K and HDR for under $1000. This is a sign of what’s coming. At the 2016 CES, YouTube joined streaming companies such as Amazon and Netflix in planning to supporting HDR video. As many have noted in the industry, HDR will probably have a more profound impact on the watching experience than increases in resolution (and most higher-end cinema cameras can already export proper HDR images in post). This is the new wave for television. Also at the 2016 CES, Samsung, LG, Sony and Panasonic all announced they will adopt HDR in their high end televisions. The first models are expensive, but that will change just as the cost of 4k camcorders has dropped. Here are some HDR TVs to check at Amazon.